Apple spent a good amount of time detailing specifics about the Apple Watch product, revealing pricing, pre-orders, and a specific release date. If you’re still not sure what Apple Watch does, it does quite a bit right out of the box and will do more as developers work on more apps for the platform. At the moment, it can receive phone calls, access Siri, offer notifications for everything from social media to sports scores, control music, pay with Apple Pay, look at stock prices, monitor health and activity information ranging from heart rate to steps, and much more. Apple Watch also runs apps like Instagram, Uber, PassBook, and likely many more from third party developers. Battery life for Apple Watch will last 18 hours during a typical day of usage, making it appropriate to charge every night with the magnetic charger. Being a notable companion for the iPhone, iOS 8.2 (or newer) will be required on an iPhone to have access to the Watch app and so that Watch will maintain connectivity when it’s away from Wi-Fi. 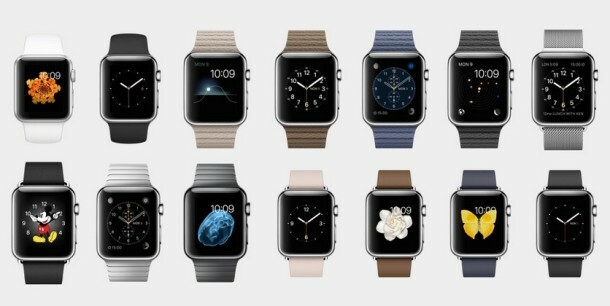 Apple Watch pre-orders begin online at April 10, with a wider release date on April 24. The Apple Watch will also be available in Apple Stores starting on April 10 for hands-on demos and to get a feel for the device before it actually ships. Pricing on Apple Watch ranges dramatically, from $349 to beyond $10,000. Pricing for the base model Apple Watch begins at $349 for the smaller 38mm model, $399 for 42mm larger model, both in the Sport model with a plastic band. The stainless steel Apple Watch begins at $549 and goes up to $1099, depending on the choice of watch band and the size of the screen. Finally, the Apple Watch Edition begins at $10,000, available in varieties of solid gold, and the price goes up from there. Those interested can have a look around the shop Watch page on Apple.com to get an idea for what they may spend on the model they wish to own. Separately, Apple released a really nice new 12″ MacBook today, as well as minor updates to the existing MacBook Air and Pro lineup. iOS 8.2 is also available. I think this device looks great! However, I think the price point is a bit high for some models. I mean, the up charge is really just for the band? Right, why not just replace the band? Or maybe that will void your warranty! As this latest Update is also aimed at the iPhone 4S, does this mean the new Apple Watch will work with the 4S iPhone, after all? I’m still a bit confused – does the watch work independently on it’s own, or do you need to have your iPhone in your pocket at all times to allow the watch to operate? In other words, what functions can the watch do independently and what functions require pairing? Can I check my email while jogging in my no-pocket jogging shorts?? Can this watch be given as a gift to someone who doesn’t own any Apple products? There’s a bigger empire called Android…. All the other brands have develop smart watches for Android, a little few (Pebbles for instance) does support IOS also, but often with less features. So now we finally have a smart watch meant for IOS, and you want Apple to make it compatible with Windows and Android aswel? If you’re confused about Apple Watch this video helps to describe it! (PREPARE FOR LAUGHS) It is funny. It is a joke, but it is a funny.